"What began years ago with the introduction of the players to the quiet village of Hommlet and the amazing lands of Greyhawk, at last is complete. Here is the long awaited campaign adventure featuring the ruins of the Temple of Elemental Evil! Evil broods and grows beneath those blasted stones. This is your chance to drive it back and scatter its forces again." So I've been mediating on I4 Oasis of the White Palm & our TPK from way back in 2011. Peter was really gungho about getting our little group of PC's back to Hommlet after the events of I5: "Lost Tomb of Martek" (1983). Probably, through a Great Race of Yith teleporter unit ( Peter the DM had a fetish about the Great Race). But something he had pointed out about the cult of elemental evil, it was already scattered to almost every level of the social strata of Greyhawk. This had been happening for centuries as evident by the evil NPC's of the Village of Hommlet. 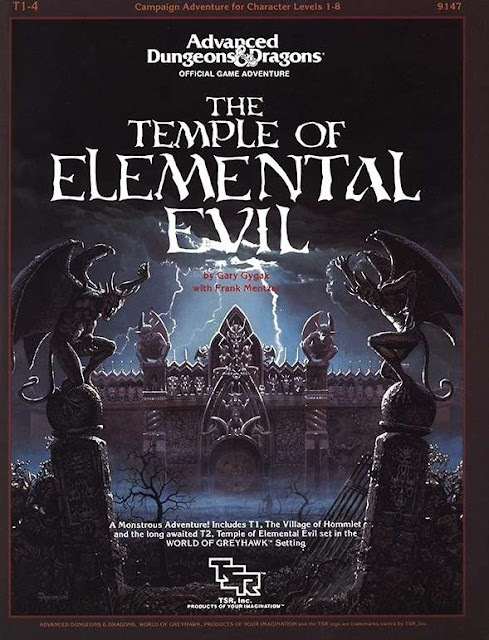 I love this blurb from the Drivethrurpg catalog entry on The Temple of Elemental Evil; "Temple forms the start of a major Greyhawk adventure path, which continues in two more super modules, A1-4: Scourge of the Slave Lords (1986) and GDQ1-7: Queen of the Spiders (1986). 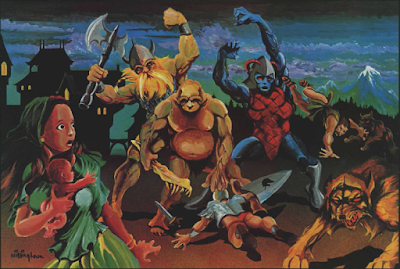 Though connected, they weren't as closely knit as the adventure paths later created from their ashes by Paizo in the pages of Dungeon." Umm actually dungeon masters for years have been connecting Temple of Elemental Evil with those modules including the Against The Giants series. But because Paizo had trade marked & copyrighted that 'adventure path' well you get the idea, simply more revisionist history but I digress. 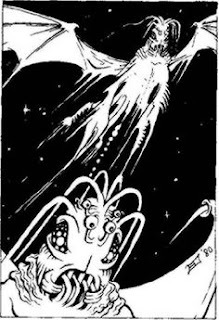 The connections to the other classic era TSR modules are deep, dangerous, & very much in the vein of the Cthulhu mythos. This is quite literal, each of the NPC's of these modules could be major players in the elemental evil cult. Your looking at world ruling cult cell conspiracy that been operating from the shadows for centuries. Peter was a completely evil dungeon master & remember he pointed this review on Amazon by Rex and Roseanna Baker from June 24, 2010: "The first time through this adventure our group did the 'bugout boogie' from the dungeon. It is like the evil of Cthulhu, from H. P. Lovecraft.It was all we could do to save our characters from death! The town of Homllet is bad enough, then the temple is creepy but seems harmless enough. We are thinking, "Let's kill some monsters and bag some loot, make this temple our hideout...", then you are suddenly hit so hard and quickly that you're ready to drop!" The enemy is diabolical and ruthless. 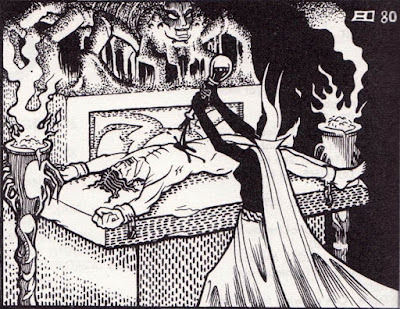 Gygax and fellow creators of the Greyhawk setting really outdid themselves in this one. They did the actual play-testing and refined it before it ever hit the shelves. If you're a DM, get it and you're a player, buy it and give it to your DM. You can always run it yourself someday, whether or not your character survives!" This review points out exactly how these cults are connected! The deep underworld of Greyhawk was never meant for mankind or his near human allies. This place is a completely alien environment & your adventurers were never invited from the start. 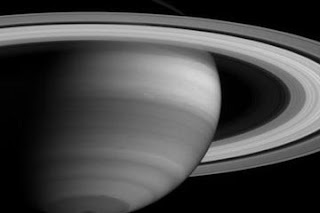 Oh, they'll end up going there anyways but this is not for mere humans. What makes the Temple of Elemental Evil so damned dangerous? Because its the entrance to the deeper evils that lay in the inner world of Greyhawk. Forget that nice comfortable 'Underdark' setting this is the weird & alien world of the old school inner world. This is a place where your PC is going to have be a bit inhuman even to survive to plump the depths of just how deep this place goes. Just watch out for the natives they can be a bit rambunctious! According to my notes from Peter's campaign there were sightings of Mi Go in some of the deeper dungeons in the hills surrounding the temple of elemental evil. This leads me to believe knowing him that he would have inner world Mi Go hives connecting from Greyhawk into the twisting alien tunnels of Underborea. We also saw Mi Go harvesting other alien pieces of the god thing from WG4 Forgotten Temple Of Tharizdun in a long forgotten tunnels. But we didn't stay to see anymore those were sights not meant for man. But one of the artifacts they were using look very much like one of the Star Stones artwork from Iram from our encounters in I4 The Oasis of the White Palm. The problem was that our party had been killed at that point. We never made it to the Forgotten temple let alone the Temple of Elemental Evil. The forces behind T1-4 Temple of Elemental Evil are the real threat & those forces are not easily destroyed. 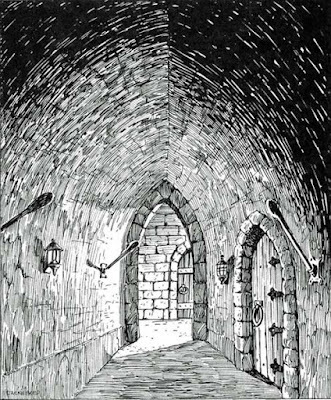 Use monsters not commonly seen on Hyperborea, the dungeon is an ancient gate system recently reactivated by adventure elements from the Temple of Elemental Evil and monsters have been coming through. The cults are recruiting in the outer territories of Hyperborea and the PC's are hired to investigate & eliminate this new evil that has arisen. Some new and dangerous humanoids have been seen in the wastelands of Hyperborea. The PC's become embroiled in a raid by an unknown species of troll and suddenly come face to face with other dimensional raiders from the temple! Several NPC's from Greyhawk begin to appear throughout Hyperborea and its up to figure out the connection. Several prophets of doom from the religion of elemental evil begin to preach its dogma telling of its coming and warning. The gods of Hyperborea begin recruiting heroes to stave back the horror of the temple and you've been recruited for this holy mission. A star spawn of Cthulhu has awakened and is destroying villages at the edge of Hyperborea. The monster has awakened because the Ashen Worm has rolled in its sleep because of the coming of the temple. The PC's must find a way to send it back to its rest until the stars are right. The drow & their giants begin to invade parts of Hyperborea as the temple's evil blossoms & evil awakens! The PC's must drive back these ancient horrors!